Over the 25 years since the restoration of its independence, Estonia has become well-known internationally for its technological advancement – it was the first country in the world to bring in e-voting, in 2005, has one of the highest internet penetration rates of anywhere on the planet, and Estonian children learn to code at school. Tuuli Lepik’s exhibition RAM: Early Estonian Computer Art, now showing at Kumu art gallery in Tallinn, gives a glimpse into the early, exhilarating years in the early ’90s when computer technology began to become a part of Estonian life, as well as posing questions about the nature of art and the consequences of the obsolescence of technology. Deep Baltic presents a selection of images from the exhibition, as well as a review by Raivo Kelomees. RAM (Random Access Memories) is the story of computer use in Estonian visual culture. The development of computer technology encouraged many people in the late 1980s and early 1990s to exploit its potential. This gave rise to a number of animations and multimedia programmes; computer graphics were produced to be displayed as art exhibitions; somewhere in the computing centres of universities, research data were being visualised in computers; the computer classes of schools witnessed busy game development on Yamaha MSXs…. The exhibition includes original equipment, which forms a harmony of multiple voices, with their lit faces and sounds, reminding us of the computer classes of the late 1980s and bringing us solitary signals from the contemporary creative industry. There are also some examples of naive computer art. Due to their exotic nature, computer animations of that time were free of any aesthetic standards regarding used images, and fell outside the sphere of criticism. The majority of electronic art remains distant from traditional aesthetics, focusing rather on technology. When putting together the exhibition, we did not consider whether a phenomenon fell into a category or not, but rather looked at how the computing environment was reflected in the inner world of the created works. RAM: Early Estonian Computer Art at the Art Museum Kumu in Tallinn, taking place from 17.02. – 04.09.2016, is an exhibition which presents us with another opportunity to discuss the history of digital art. It is undoubtedly held in one of the most prestigious exhibition venues in Estonia, providing a thoroughly selected compilation of digital art from the late 80s to the early 90s. Tuuli Lepik has been dealing with new technologies since the 90s and defended her MA thesis in 2004 with the title END IF or An Overview of Early Estonian Computer Art. In my humble opinion, she is the author of one of the most beautiful multimedia artworks made in Estonia in 2000 called Artificial Intelligence. This project led me to want to talk about an area of media art conservation which is currently of great interest — the preservation of digital-born projects. Whilst a lot of creative talent and beautiful artworks have been contributed to this field, they are gradually fading, becoming less available as programmes and computer platforms become obsolete or evolve. A British artist who has been responding to this question of obsolescence in Estonian media art is Chris Hales, who teaches at several institutions in Estonia, Latvia, Lithuania and Finland. Hales has curated a considerable amount of digital artworks that could be categorised as “interactive cinema”. Despite his earlier days being full of witty creative energy spent expanding the possibilities of interactive storytelling, Hales observed the unfortunate decline and gradual fading of this field as it shifted further towards the periphery. Nevertheless, he has continued to react flexibly to the technological changes. He has adapted his interactive narrative course to teach a variety of up-to-date software and hardware platforms, recently incorporating commercially-available headsets used to measure scientific data from brainwaves. Tuuli Lepik’s exhibition similarly highlights the obsolescence and progression of computers by presenting interesting digital artefacts that are clearly outdated from the late 80s to the early 90s. Her exhibition illuminates the way in which animations and multimedia-like programmes were created back then. 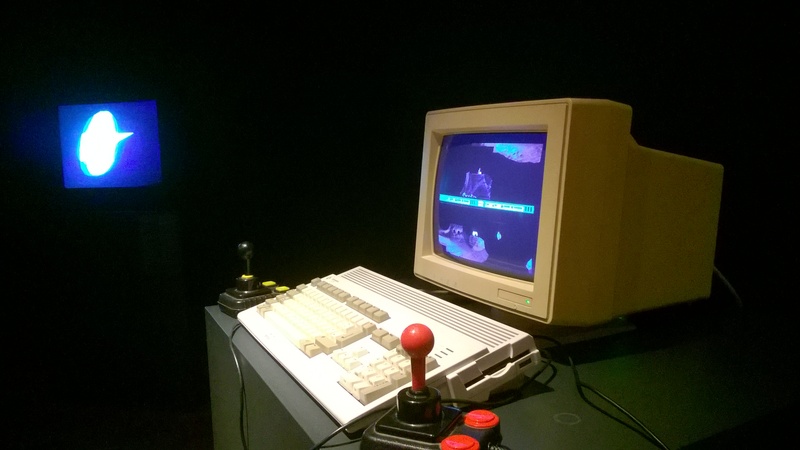 The exhibition makes it possible to see how computer graphics were produced, how scientific data was generated and visualised in university computer centres, and how the Yamaha MSX was used in schools for game development, amongst many other pioneering insights. Despite whatever aesthetic evaluations these productions could be assigned to, it is possible to place all of these into a “history of computer art”. What is also clear is that these projects all vary in innovation. They all have different qualities which range from being very simple, almost naive projects, to works containing universally recognised visual and aesthetic qualities. The exhibition reveals the constraints of that era, showing how the “visual quality” was, of course, dependent on the limitations of the software and hardware of its day. But in spite of this, numerous examples remain fresh and are still of interest today. Looking back at the early days of digital art and comparing them with the recent fever for technological start-ups, it is possible to begin forming some conclusions. At the beginning of the 90s, several games including Kosmonaut, SkyRoads and ROKETZ were designed by BlueMoon Software. Jaan Tallinn, Ahti Heinla and Priit Kasesalu were programmers who later went on to develop Skype, and also became known as the designers of the early file sharing software Kazaa. Nowadays they are developing delivery bots at Starship Technologies. Though Skype was bought by Microsoft and belongs to the everyday life of “netizens”, what remains of interest and is important to demonstrate is the influence certain designers and programmers of the early Estonian gaming industry had on our everyday global communication. During the 90s and the 00s, software designers and artists were more free to form connections and collaborations, working on all different types of products. Nowadays, they could not be more separate having shifted into discrete boxes. Those with serious IT and technical competency skills seem less concerned with anything other than entrepreneurship. To conclude, it is clear that creative practices based on digital technology have spread practically everywhere, from visual art into applied fields. The world encounters digital technology in the theatre, at the cinema, in numerous scientific fields and occasionally in galleries presenting interdisciplinary exhibitions and projects. Where once it was possible to identify specific groups of avant-garde innovators appropriating new technologies, these days it has become harder to distinguish them in our world where digital technology has become a cross-cultural constant. Rauno Remme – Wanna Play? (1992) The programme was written in Basic to parody computer games; there is no possibility of winning. Raivo Kelomees, PhD (art history) is an artist, critic and new media researcher. He studied psychology, art history, and design in Tartu University and the Academy of Arts in Tallinn.